HIS is a graphics card company that primarily builds ATI-based products. They are a Christian company as well. This is part of their company statement: HIS was established in 1987 with the mission to produce the highest quality graphics cards in the industry. Besides strong devotion to excellent products and services, HIS has been conducting business with the aim to "Glorifying God". Honesty and integrity are the two key principals of how HIS are conducted. Ethical business practice has been an everyday commitment to our clients, vendors, and investors. Most of us pick a video card based purely on chipset and price. It\'s good to see HIS is more than a typical ATI card manufacturer - they have a mission that CCG can agree with. Even so, this review is based on the quality of the product reviewed; no unnecessary bias has gone into the review process. We ran the benchmarks using a 64 bit version of Windows 7 Professional. Windows gave the 5570 a 6.8 rating in desktop and gaming graphics. I no longer consider the Windows ratings to be valid since the 4650 got a 6.4 gaming score and it’s in last place on all of the charts. All of these benchmarks were ran at 1920x1200 wide screen resolution. The NVIDIA driver used was 195.62 and all but the 5570 ATI cards were using 9.12. Since the 5570 is brand new, I had to use the 8.56.1.15 drivers on the CD it came with. I no longer have some of the previous cards in my possession, but when I re-ran the benchmarks with the 4650, there was no difference in performance between the two drivers. These results were obtained using the performance test at the default resolution of 1280x1024. The HD 5570 comes in second to last place falling right between the HD 4650 and the 8800GT. The Unreal engine is known for its beauty and hunger for powerful video cards to run the latest games. For this benchmark we used UT3 version 2.1 (black edition). Sound and DirectX 10 were enabled. The 5570 is playable with an average of 38 frames per second. The HD 5750 more than doubles the performance of the HD 5570. The Dunia engine is what powers the African based Far Cry 2 game. The detail and explosion effects are amazing. This benchmark would not run with antialiasing or anisotropic filtering enabled, and everything else is set to high detail. ATI cards seem to do well with this engine but the 5570 is hurting with less than thirty frames per second. This benchmark has antialiasing and anisotropic filtering set to 4X. The detail was set to High Quality and soft particles were disabled. This is an older game and the HD 5750 is playable at 35 frames per second. This engine is older and all of the cards get great results here. Maximum quality was used, motion blur and bilinear filtering was enabled, and antialiasing was disabled. The HD 5570 does well here and can probably handle the Left 4 Dead games just as well. We ran this benchmark with very high detail. The graphics in this game look amazing. With an average frame rate of 13, the HD 5570 will have to have the detail or resolution lowered to make this game playable. The latest Crytek engine has been notorious for bring many systems down to their knees. These cards struggled. This benchmark was ran under the Very High setting which is not recommended; even the GTX260 was in pain here. I wouldn’t attempt to play Crysis on the 5570 but if you insist, lower the detail as much as possible. labeled DX11. The benchmark race results vary so I don’t consider it extremely accurate. The HD 5570 is not quite playable here. 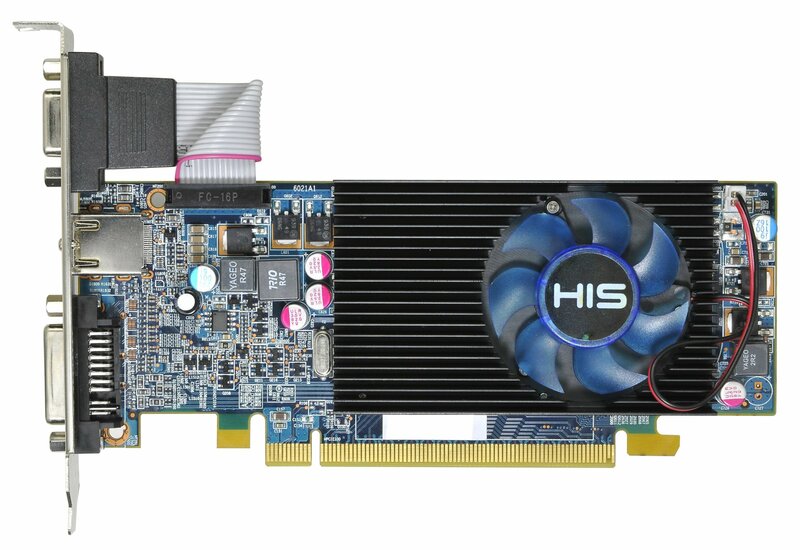 The HD 5570 is an interesting card. It can play older games but it’s been too crippled to play many of the newer titles. The DDR3 memory limits the card considerably. The best selling feature is that it has a low profile making it great for small form factor multimedia PC’s. This card sells for around $85 and if you’re planning on getting gaming card for less than $100 get a 9800GT instead. If you’re looking for a powerful, low?profile, and high definition cable video card, look no further than the HIS HD 5570.